Fifteen species of coarse fish (so named for their large, rough scales) have been introduced to New Zealand for aquariums or fishing. A few aquarium fish have found homes in warm, geothermal waters, while other species thrive in rivers and lakes. But several species have infested ponds and other waterways, and are considered noxious. Coarse fish are freshwater fish other than trout or salmon. They are called coarse fish because their scales are usually larger and coarser than those of trout or salmon. They were introduced in the late 1800s and early 1900s by British settlers, for aquariums or fishing. Many have been illegally set free by anglers wanting to stock up rivers and lakes. 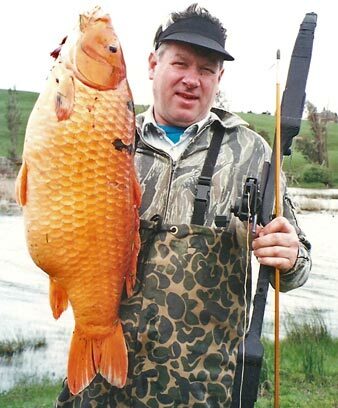 Fifteen species of coarse fish have been brought into New Zealand: goldfish, koi carp, tench, rudd, orfe, gudgeon, grass carp, silver carp, gambusia, caudo, common guppy, sailfin molly, swordtail, European perch and catfish. European perch are popular with anglers, and are considered the tastiest to eat. Gambusia were introduced to help control mosquitoes, although it is uncertain how effective they are. Goldfish were imported as ornamental fish for aquariums and ponds. They were set free in the 1870s, and can now be found in ponds and small lakes mostly in the North Island. Grass carp are useful – they eat the underwater plants that clog ponds and drainage ditches. Koi carp churn up the beds of wetlands, and harm the ecosystem. It is illegal to own them, and if found in the wild they are poisoned. Orfe and gudgeon were introduced illegally for fishing, but have now been killed off. Rudd were smuggled into New Zealand in the 1960s and released for fishing. They are now considered a pest in most places, except Auckland and the Waikato, where you can apply for a licence to fish for them.